Nica says "Lovage is the King of the soup!". 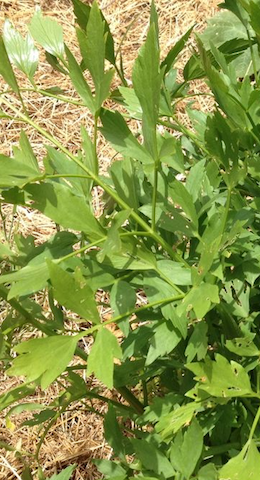 in exchange for some fresh lovage and the promise of some seeds when they ripen. The meat is cut in small pieces and put to boil in a 4kg pot, with water. After 30 mins, put the onions, carrots, celery and parsley root, all of them cut in small pieces. After 40 mins, put the rice, lovage leaves (finely sliced), potatoes (cut like in a salad), leave everything to boil for 30 – 35 minutes, then add the tomato juice and some salt to taste. Boil for 3 minutes, add the dill and turn off the cooker. Enjoy! 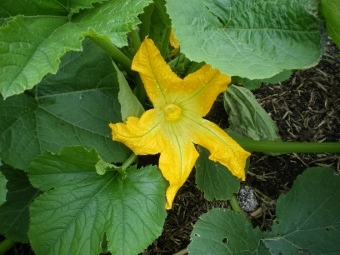 The zucchini's are coming! We've had a spate of warm weather, and the zooks are growing from babies to monsters in a few days. 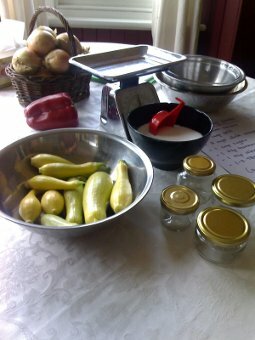 Soon we'll have a pickling party again. In the mean time, here's a zook pickle recipe! There are many variations to this, so if you have a fave recipe, feel free to improvise. I sometimes add finely sliced red capsicum for colour, or red chillie if you like it hot. Amounts for 1 kilo of zucchini (or beans). Cut zucchini & onions in thin slices; place in bowl and cover with water & the salt (or just mix with salt and leave the water out). Let stand 1 hour then drain. Mix vinegar & remaining ingredients and bring to the boil. Pour over zucchini & onions. Let stand 1 hour, then return to pot and bring to boil and cook 3 minutes (5 minutes for beans). Or if you're in a hurry, don't stand for an hour, just boil for 15 mins. See, lots of options! Pack in hot sterilized jars and seal. First, cut up your pumpkin into cubes about 2cm across, toss in oil and a little salt, and roast. BE CAREFUL when cutting a big pumpkin with a hard skin. A good technique is to stab your knife or cleaver into the shell, then use a mallet or something to gently tap the blade downwards. While the pumpkin is roasting, slice the leeks and saute in a little butter and oil. I used about four small leeks from the garden (oh my so sweet!). Break up mushrooms into pieces, and add to leeks after about 5 minutes to cook a bit. I used about 2 big handfuls of mushrooms. You could probably use any other roast vegies or combination of flavours that you like in this dish. Line a tart dish with short crust pastry, and blind bake. Then arrange your vegie selection evenly in the shell, and pour over a custard made from 1 cup cream and 4 eggs. To make it even richer and more decadent, thinly slice some brie and arrange the slices on the top! I know - its wicked!! Bake in a moderate oven about 25 mins or until just set. Let sit for 5 minutes, then cut into wedges to serve. Mmmmmmmmmmm! 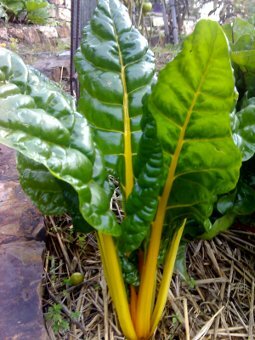 At this time of year when gardens are looking a bit bedraggled and when there's not always alot to pick, silverbeet or rainbow chard is always a good looking, strong growing stalwart. One plant is usually enough for a family, but its quite common for people to have several - there's nothing so reassuring as a strongly growing plant! Lots of people say they don't really like to eat silver beet. Try this recipe, its delicious and easy and can convert even the most skeptical diners! First trim the stems out of the silver beet or chard leaves. To do this, run a small sharp knife up either side. Rinse the stems and slice across ways finely. Slice a few onions, whatever colour you like best, and saute 5 mins in some oil and butter. Add the sliced silver beet stems and a clove of crushed garlic. Let this mixture cook gently about 10 - 15 minutes, then add a handful of raisins (reallly yummy if soaked in some verjuice first) and a handful of toasted pine nuts, and the silver beet leaves (that have been washed, dried, and finely sliced). Put a lid on to wilt the leaves, then turn gently for a few minutes, then serve hot! Mmmmmm. This can easily become a whole meal if you serve it in a large bowl with a few poached eggs nestled in the centre. Cheap, easy, sublime food. This jam is truly delicious, and simple to make. Sues gave me the recipe, and I've been making it frequently since. The gorgeous ruby colour and exotic taste make it a great gift. We had some at the Waterworks valley fair stall today, and several people asked for the recipe. So here it is! Place rhubarb, apple, vanilla bean and water in saucepan over medium heat. Cover and cook for 5 minutes, or until rhubarb is soft (takes longer if you do a big batch). Add lemon juice and sugar, and simmer uncovered 45 - 60 minutes or until mixture is thick. While jam is cooking, remove foam from surface with large metal spoon (but I don't because lots of vanilla seeds are in the foam!). To test if jam is set, place a small spoonfull on well-chilled plate - it should immediately thicken. Place in sterilised jars and seal. One of the heirloom bush beans I grew this year were called "Dragon's tongue". The pods were green with spunky red stripes on them. I left some on the bush (ok ok I didn't see them for a week and they got too big) and as the pods grew bigger and fatter they also changed colour to be white with red stripes. I opened one up and inside were snuggled the most attractive looking bean seeds - white with red flecks, quite chubby and looking just like the borlotti beans my Nonna used to love. So here's a kind - of Tuscan bean recipe. I made this with the borlotti style beans, plus the seeds from some extra fat purple beans and even some from the wax beans. All tasted EXCELLENT! Fry on medium heat with a little oil (and butter for a luxurious taste) some diced onion, celery and carrot, about 1 - 2 cups all together. Add chopped bacon, about 2 rashers. When the vegies are golden and softening, add a finely chopped clove or two of garlic. Now put in a couple of big handfuls of freshly shelled bean seeds (from ones left on the bush too long for fresh green eating). Add a glass of white wine, then top up with water or stock to just cover beans. Chop 2 ripe tomatoes and add them, plus a good handful of chopped italian parsley and basil if you have it. Thyme would be nice too. Simmer on medium to low heat for at least half and hour, stirring occasionally. Test for softness - keep cooking until the beans are tender. This could take an hour or so. Serve either as a thick soup with toast, or as a side dish to best quality italian pork sausages. YYYUUUUMMM! 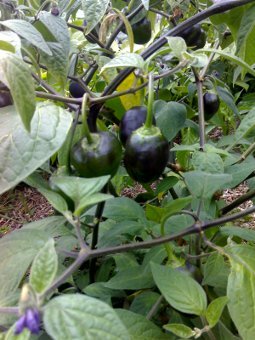 News flash - since writing this recipe, the chillies have started to go red, with black seeds. They are DYNAMITE hot!!! So if you proceed with this recipe using fully red ripe chillies, take care! Boil 3 - 4 medium potaotes, then peel and thickly slice or chop. Fry up 1 medium onion, thinly sliced, in oil or butter. When soft and slightly coloured, add 2 cloves finely chopped garlic, 4 to 5 thinly sliced mild to hot chillies, half a capsicum (or whatever is left over in the fridge) and fry another 5 minutes or so. In a separate bowl, mix 1 -2 good handfuls of finely chopped parsley and spring onions (and basil if you've got some) with about 8 eggs, salt and pepper to taste. When cooled down, add the potato and onion mix to the eggs, mix gently. Warm butter and a little oil in a frying pan on medium heat, when bubbling pour in frittata mix. Cook gently till bottom and sides set. Then put under medium heat in the grill until top is set. try not to let it brown too much. Delicious hot, warm or room temperature. Well all our FIMBY gardeners are starting to pick zucchinis by now, and everyone also has basil growing well, so here is a favorite way to eat them together! a few torn basil leaves. Jam the lid on and cook over medium heat, giving the saucepan a shake every now and then. When the zooks are just starting to colour, and just getting soft, eat 'em! Enjoy. Later in the season when the novelty of eating gorgeous new young zooks has worn off, we'll post a delicious pickled zucchini recipe. Maybe we'll have a pickling session all together . . .
Another couple of great friends that are picking nicely at the moment are beetroot and carrot. Great friends in the kitchen, but not so great friends in the garden. Peel and chop the carrots into chunks, or leave them whole if you're eating baby carrots from the thinnings! Boil or steam, and drain. Wash the beetroot and boil until tender. Drain, then peel under running cold water, and cut into chunks, or halves if they're baby beets. While the vegies are still warm, toss with good olive oil, vinegar or lemon juice, salt, and lots of chopped parsley and chives. Beautiful served warm, also good room temperature. Even good the next day. 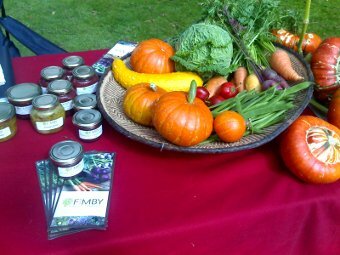 As Robyn, one of our FIMBY friends said today, you just can't beat a root!